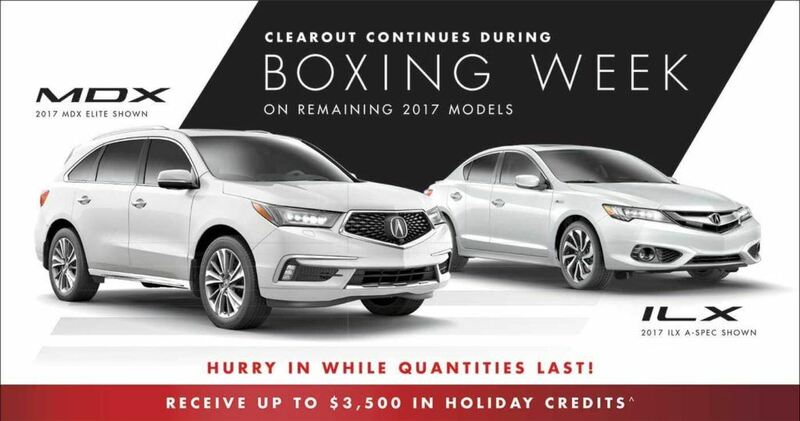 Our Boxing Day Offers at Acura Pickering won’t last long. Hurry in before January 2, 2018! Until January 2, 2018 receive 0.9% APR lease and purchase financing on new 2017 MDX Base and new 2017 ILX Base models for 24 months, available through Acura Financial Services on approved credit. Additional $3,000//$3,500 in Holiday Credits can be combined with lease/finance offers on new 2017 MDX//2017 ILX models. All incentives will be deducted from the negotiated selling price after taxes. *Cash rebates of $6,500//$4,500 available only on the cash purchase of new and previously unregistered 2017 Acura MDX*, 2017 Acura ILX Premium*, Tech & A-SPEC models from us when registered and delivered before January 2, 2017. Cash rebates consist of $3,500 // $1,000 cannot be combined with lease/finance offers and (ii) $3,000// $3,500 that can be combined with lease/finance offers. All incentives deducted from negotiated selling price after taxes. Additional terms and conditions apply. See us for details.